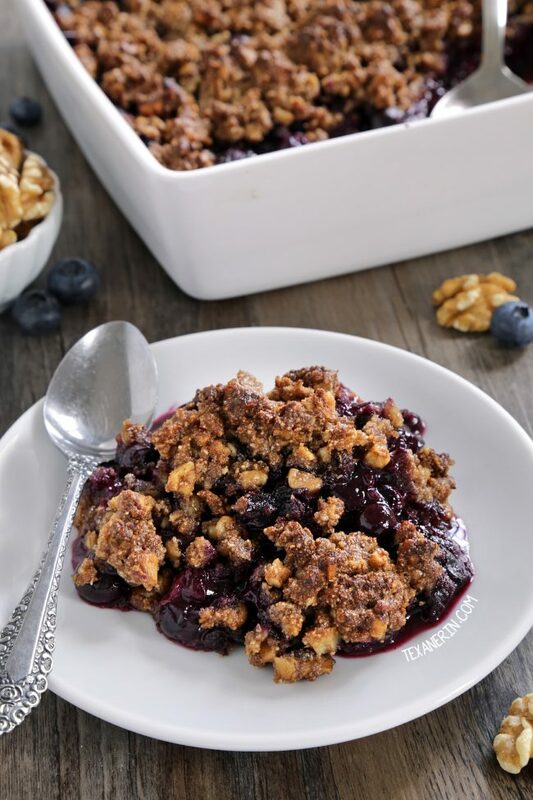 This paleo blueberry crisp is entirely maple-sweetened with a delicious walnut and almond flour based topping! It’s also vegan, gluten-free, grain-free and dairy-free. 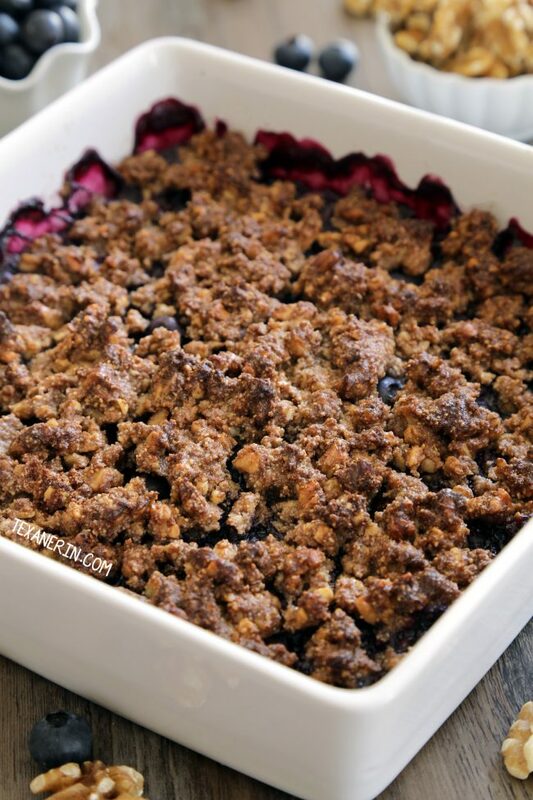 First off, if you don’t want a grain-free crisp, try my vegan blueberry crisp. It uses white whole wheat flour and has a nice, thick layer of topping! So for this paleo blueberry crisp, I used the same topping that’s in my paleo apple crisp. People seem to love that recipe and I figure why fix what’s not broken? There’s a cup of chopped walnuts or pecans in the topping. You can use a knife for the chopping but the last time I made this, I realized it’s a whole lot quicker to toss the nuts in the food processor and pulse a few times. I don’t recommend doing that in a high-speed blender like a Blendtec, though. It chops them too unevenly and you’ll end up with some pieces that are on their way to becoming nut butter and then some pieces that didn’t get chopped at all. To top it off, I recommend using this paleo vegan vanilla sauce. And this is kind of weird, but I think this paleo vegan maple cream frosting would also be awesome alongside it. You can see in the pictures of the frosting post that it’s not super firm like a regular frosting. And when you make it and before chilling, it kind of has a whipped cream consistency. And the maple combined with the blueberries?! So good! If my blueberry crisp doesn’t strike your fancy, this gluten-free berry crisp from Crunchy Creamy Sweet also looks delicious! If you’ve already moved on to apples and away from berries, try this old-fashioned apple crisp from Barefeet in the Kitchen! This paleo blueberry crisp is super easy and straight-forward so I’m done talking about the recipe. Scroll down if you want to skip over my little life update! Like I mentioned in my last post, these no-bake oatmeal cookies, I’m 6 1/2 months pregnant and we’ve moved to Munich! 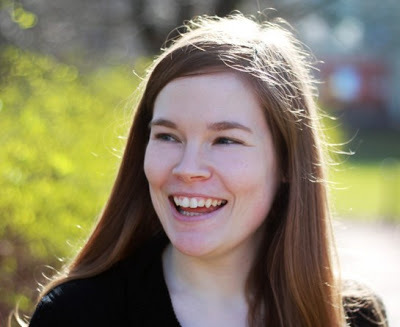 I had lived in Berlin for 8 years and wanted to move almost from the very beginning, so to say that I’m happy about the move is an understatement. A big part of the reason why we’re not all settled in yet is because I’m not really doing anything to help. I can’t build furniture and even unpacking boxes doesn’t really work well for me at this point (thanks to some lovely pelvic bone pain that makes doing anything painful). Preheat the oven to 350 °F (175 °C) and get out an 8"x8" (20cmx20cm) baking dish. In another medium mixing bowl, stir together the filling ingredients except for the blueberries. When well combined, gently stir in the blueberries and coat in the liquid mixture. Pour the blueberry mixture in the baking dish. Bake for 35-40 minutes or until the topping is firm and the blueberries are bubbling. The topping will crisp up much slower than a traditional crisp, but don't worry as it will crisp up towards the very end of the baking time. Cover the crisp with foil if the topping starts to brown too early. Let cool for 10 minutes and serve. If not serving immediately, once cool, loosely cover with a piece of plastic wrap (so the topping doesn't go soft). If storing overnight, properly cover the crisp with plastic wrap. Do note that the topping gets soft on the second day. Serve with vanilla sauce or ice cream. 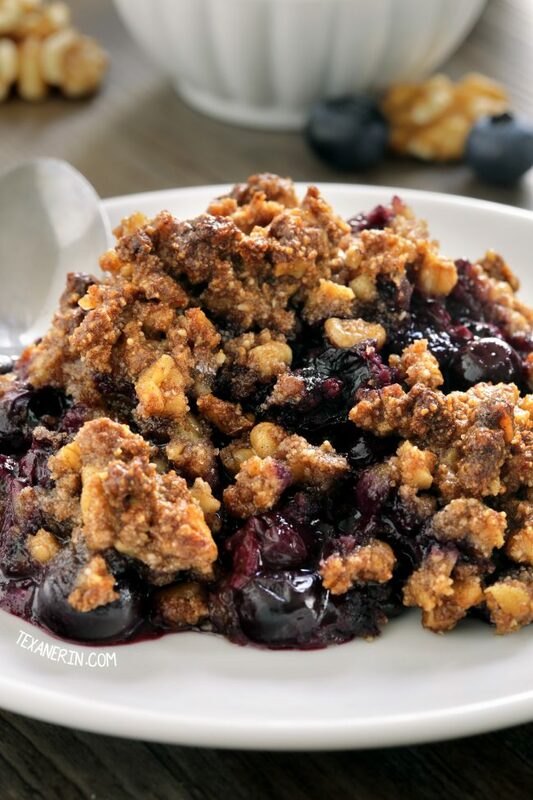 29 comments on “Paleo Blueberry Crisp (vegan, gluten-free, dairy-free)” — Add one! Do you have any paleo-friendly suggestions on what to sub for nuts in the crumble topping (for picky eaters)? I’ve made the crumble w/o nuts, which they liked, but hoping for a crunchy paleo sub instead of completely omitting the nuts, which results in less crumble. I have been using this recipe for a couple of years now, it is universally loved in my household. Personally I don’t like the taste of cinnamon in this dish and prefer it without it, but that is totally subjective. Although pure blueberries are wonderful, I have used apples in the winter and in the late summer I halve the berries with fresh peach slices which is probably my favorite modification. Thank you so much for this wonderful recipe, I don’t miss the traditional taste at all, when I occasionally have had a mouthful from a friend’s dish at a restaurant it tastes way too sweet without enough of the deliciousness of the fruit coming through. Omg this is delicious! I used a mix of blueberry, blackberry, and a bit of apple. The topping is divine, thank you! Oooh! That sounds delicious. :) So happy that you liked it. Thanks for the idea and for your comment! I love this recipe but sometimes coconut flour is hard to find. Can I use coconut flakes instead of coconut flour? Can I sub almond flour for coconut flour? Unfortunately, nuts flours aren’t interchangeable with non-nut flours. You could try another type of nut flour / meal, though! I have a ton of frozen blueberries would that be ok to use? Do I need to adjust the recipe. I haven’t tried it but I think it’d be okay! I don’t think there’s any need to adjust the recipe. I’d love to hear how it comes out! 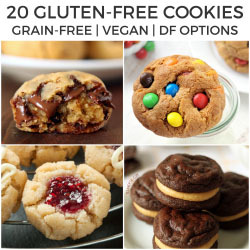 Would using unblanched almond flour work as well? Your recipes continue to be AMAZING! Thank you!! I substituted with blackberries, since my husband likes them better than blueberries. It is delicious! It’s a keeper!! Oh, wow! Do you have a blackberry bush? I don’t even want to think about how expensive that would’ve been with blackberries from the grocery store. ;) So happy you liked the crisp! Thanks a ton for your feedback. Hey, Erin, I adore blueberries really. I could eat the whole box of blueberries in one sitting and this blueberry crisp looks like heaven, my god. I am definitely gonna try this for sure. Thanks for share this recipe with us, Looking forward to more, Best wishes and Regards. This blueberry crisp looks like heaven! I’m a big fan of your blueberry crisp with white whole wheat flour, so I’m sure that the paleo version is equally tasty! Great tips for chopping the nuts! I’d love to try the crisp topping with coconut and almond flour. This looks absolutely delicious! This crisp is definitely calling my name — looks delicious! Oh. Girl. This *definitely* strikes my fancy! I looooove all the walnuts in this, too. Cannot go wrong with summer’s blueberries! Your photos are seriously making me drool! Those blueberries looks so juicy and delicious! Can you believe I haven’t had a crisp ALL SUMMER!? I clearly need to make this! !